Mike clearing the 30″ box with ease. This Saturday we are holding our free and open to the public workout at 9am. THEN… we are hosting the CrossFit Open workout #3. 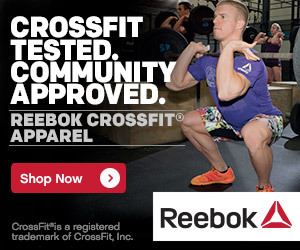 We should have some peeps from nearby CrossFit affiliates rolling through our doors. Heats will start at 11am, so please be warmed up and ready to rock prior to your heat start time. Sign-ups for heat sheets will be available game day. Mark your calendars for Sunday, April 10 (that’s this weekend!) at 3pm. Bethanie (& family) are hosting a BBQ up on Glade Park. Bring a Paleo dish to share and come hang with our growing family outside of our gym walls. See the flyer at the gym for more details.